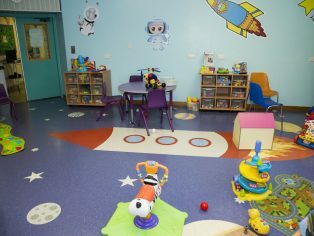 An “out of this world” flooring design using Polyflor’s vinyl flooring helped bring an extra dose of fun to a play room at the Nightingale children’s ward at Chesterfield Royal Hospital recently. Polyflor’s in house Design Service created this bespoke floor design for the children’s ward, featuring a colourful rocket ship, planets and stars. The design elements of the floor were manufactured by Polyflor then cut into the sheet flooring on site County Contract Flooring. 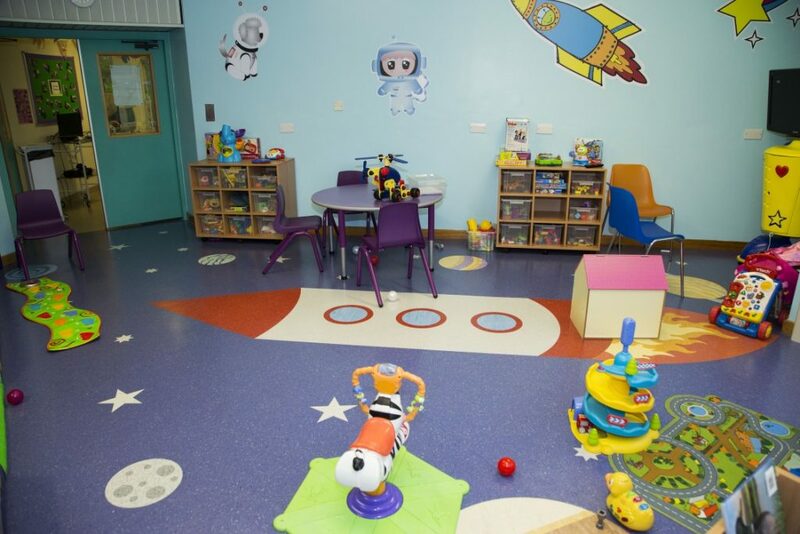 Polyflor’s Pearlazzo PUR vinyl sheet flooring in Purple Crush 9722 was used as the backdrop to the play area’s space themed designs which were a mixture of colours from the Pearlazzo PUR, 2000 PUR, Classic Mystique and XL PU homogeneous vinyl ranges. The Pearlazzo PUR collection features 24 bright, pastel and neutral shades with pearlescent multi-flake decoration. This range is an increasingly popular choice for hospitals and other healthcare environments thanks to its UV cured and cross-linked polyurethane PUR coating which allows for an easy-clean, polish-free maintenance regime. Polyflor’s experienced Design Service works frequently with specifiers to create bespoke design floors for children’s wards and other areas within hospitals. With the flexibility of water jet cutting there is virtually no limit to the shapes, patterns or designs that they can create for customers using Polyflor’s high performance flooring, including intricate logos and important signage. The Pearlazzo PUR flooring collection achieves an individually certified BRE Global A+ rating in healthcare facilities which can contribute to BREEAM credits, as can the products’ BES 6001 certification which demonstrates compliance with a recognised responsible sourcing scheme as certified by the BRE.